Usually when a person decides he or she is going to quit a job, it’s not an overnight decision. Oftentimes, it is the product of years of frustration and disillusionment that leads him or her down the path toward unemployment. By the end, every little thing will annoy the worker to the point of anger and resentment, and the thought of just walking out is almost too much to bear. 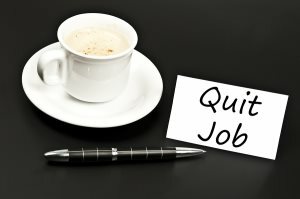 So, how does a person quit a job without drastic measures? It seems simple enough, and most people who make the mistake of quitting their jobs also make this one. Too many assume their worth in their field is enough to get them hired and they shouldn’t worry about the downtime of unemployment because it wouldn’t be long. Even still, there are other things to think about, like when will your benefits start or when will you receive your first paycheck? If your current job pays weekly and your new one would pay bi-weekly, do you have some vacation pay or sick pay that you will be paid to make up for the time in between? How long will you still have to go to work despite not getting a check? In many jobs, there is a period before your first check that adds a week or more to the length of time it takes to get paid. This can be detrimental to those who did not plan ahead. Make sure you have a replacement job and make sure you know how long you will go without a check before you turn in your nametag. When you quit, not only do you have to tell your employer, but everyone will want to know why you quit. This includes your next employer. Make sure that what you have planned to tell people is both truthful and positive. Staying positive about your former company will keep you from looking like a bridge burner and staying positive about your unemployment makes it seem like a well-crafted move. Employers are going to want to know you didn’t quit or were fired on the spot, so make sure you make them understand that it was your plan all along, and that it worked perfectly. When you find yourself unemployed, make sure you aren’t just turning in applications all day. Find something productive to do, either a class or certification you could receive or community work you can do. This will make sure you don’t get bored at home, or worse, complacent, and also look good on the resume. You want the image of you quitting to be about you carefully planning – you didn’t want to be there, you would rather do other things for a while, and also you would like to work where you are applying. Not that you left suddenly and now need a job. That gives employers power, which they already have a ton of. Try to retain some of that power with a little bit of spin and some productive downtime work.